Graham Spray Equipment rolled out its new 600-gallon spray rig and 300-gallon compact unit. 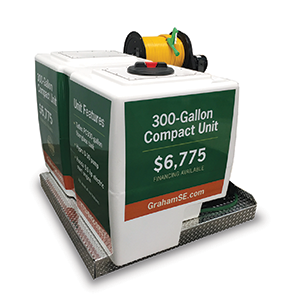 The spray equipment is designed to meet the needs of lawn-spray businesses that don’t need all the capacity and features of Graham’s full-scale 600- and 300-gallon spray units, the company said. In a 10-month season, Graham estimates the 600-gallon unit can generate $200,000 in revenue, based on spraying 20 6,000-square-foot lawns a day at $50 per lawn. The new 600-gallon spray rig, consisting of the spray equipment and Isuzu truck, retails for $49,900. The 300-gallon compact unit, which fits a three-quarter ton pick-up truck and includes wheel-well cutouts, retails for $6,775.